What becomes a legend most? How about moving gracefully into middle age? "Mr. Bingle," that syrupy, smiling, little stringed puppet character who has been with us every Christmas seemingly since the first one at Bethlehem, has done just that: no noticeable paunch (he's always been a little overstuffed), no failing eyesight, no receding hairline. And thank God it is so! At 41, Mr. Bingle will be with us again this Christmas, remaining a constant symbol of whatever we wish Christmas to be. Mr. Bingle is, of course, indelibly stamped as a Maison Blanche creation, cavorting as the main character in the marionette Christmas shows in the store's giant windows on Canal Street. And over the years we've watched him zip over to Charity Hospital to visit a poor kid who was in at Christmas time to get a tonsillectomy. We remember him on the Midday Show on WDSU-TV buzzing about the head of then-host Terry Flettrich. 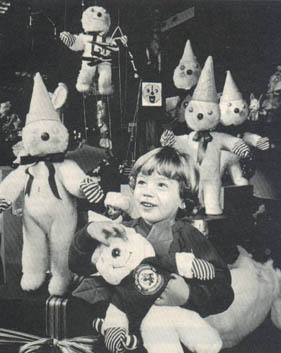 How could we ever forget "Breakfast with Mr. Bingle," a sort of kids' dinner playhouse staged daily for hordes of youngsters while their mothers shopped the Canal Street store. And that two-story-tall cutout of Mr. Bingle bearing the message, "Mr. Bingle is here with Christmas cheer," on the front of the Canal Street Store. That's what Mr. Bingle was ... and still is: a transition back to those kinder, gentler days when you bought your Christmas tree at the Jefferson Feed and Hardware Store on Magazine Street, then visited your aunt and uncle's home and drank eggnog and watched as they wrapped simple, non-lethal, non-battery operated, kids' toys, things like skates and dolls a good-looking catcher's mitt bearing the name "Yogi Berra." And, all the while the sounds of Bing Crosby drifted in from the big Emerson record player in the next room. And everywhere was the smell of that jaw-shattering, sweet candy your aunt used to keep in "Dese candy dishes I got from Woolsworth" all over the house. Oh, let us not misunderstand. Lo, these past 42 years the Mr. Bingle through whom we have been flushed with the holiday spirit has not exactly been standing still. For though he looks basically the same, there have been changes. In the early 1980s, Godchaux's Stores bought out Maison Blanche. But MB kept its name in New Orleans. Then Maison Blanche bought out two other companies -- May-Cohen and Robinson's, thereby spreading into Florida. The Canal Street store closed down from 1982-1984, then reopened, and most of the world has disdained downtown shopping for the Muzak-induced coma-walk of mall shopping. The original singular Mr. Bingle has been marketed ferociously ("Thousands and thousands of Mr. Bingle dolls have been sold," says Maison Blanche Senior Vice President Don Bell). And where Mr. Bingle's Christmas turf was once confined to the windows and playhouses of the Canal Street store and a few other nearby stops, our Christmas 1989 version of "Mr. B" will appear live at the White House and at the Citrus Bowl Football Game in Orlando this yule season. In addition, look-alikes of the original spreader of cheer will star in shows in Maison Blanche stores in Baton Rouge, Lafayette, and, of course, New Orleans. In Florida, he will appear in shows in MB stores in Naples, Fort Myers, Sarasota, Tampa, St. Petersburg, Clearwater, Lakeland, Daytona, Orlando and Jacksonville. And while Mr. Bingle himself remains virtually unchanged, he has been spiffed up a bit to keep in step with the times, we are told. The 1989 edition sports a red woolen sweater emblazoned with a logo which reads "Mr. Bingle University '89 ... Maison Blanche." (Mr. Bingle University? Huhh?) There's a Mr. Bingle "Watch Me Grow" chart to record a kid's growth ... and the list goes on and on. Maybe they teach marketing at Mr. Bingle University. In short, in addition to being a key to the door of the nostalgia room, Mr. Bingle is big, big business for Maison Blanche. "Mr. Bingle is to MB what fried chicken is to Al Copeland ... big bucks," says one Maison Blanche employee. A lot of money comes in ... and goes out because of Mr. Bingle. "He (Mr. Bingle) does not come cheap," says Bell, who is director of all MB stores. "When you look at marketing, storage, upkeep, transportation, putting up Mr. Bingle on the Canal Street store, taking down ... you're looking at a hefty chunk of my advertising budget." So just who is this stuffed little personification of everything that makes us feel all cuddly and warm and soft about Christmas in New Orleans and where did he come from? For that tale, Horatio Alger himself could not have written a more born-in-a-log cabin, rags-to-riches story of how a bonafide American hero is made. Actually, the Mr. Bingle tale is two stories about two different people. One story is about this funny looking snowman doll wearing an ice cream cone hat, holly wings, and clutching a candy cane. The unnamed doll was bought on a whim at a trade show by a Maison Blanche sales promotions director back in the late 1940s. Nobody else wanted the odd-looking little character, so the guy from MB bought it. That would have been the end of that story, probably, except for the second story. This one is about a living, breathing, chain-smoking, hard-drinking drifter named Edwin Harmon "Oscar" Isentrout, who learned how to restore dolls at Public School 9 in Brooklyn. Isentrout had kicked around the country working at everything from puppeteer with the world-famous Zuzares Marionette Troupe to supper clubs, movie theaters and finally supplying the bums and grinds to a "striptease puppet" at a joint on Bourbon Street. He had picked up the name "Oscar" from a billing somebody once laid on him and his puppets. "Oscar and the Little Woodenheads." Isentrout lived in the French Quarter in the late 1940s and fell in love with those big windows at the Canal Street Maison Blanche. He sold the MB brass on the idea of letting him put on a Christmas puppet show. While he was doing that he was introduced to the funny looking little rag doll nobody except the MB sales promotion director had wanted. Christmas in New Orleans was never quite the same after that. "Oscar was Mr. Bingle and Mr. Bingle was Oscar," Bell says of the man who named the doll to rhyme with "Kris Kringle." The fact that Mr. Bingle's initials are also those of Maison Blanche didn't hurt. "It was unbelievable," Bell says. "I'd go to Oscar's office to talk to him and I'd hear him having a conversation with somebody. I didn't want to disturb them so I left and came back. He was still having a conversation with Mr. Bingle ... doing both voices." Back in those early days the Maison Blanche promotions people would fan out around August to try to round up Isentrout to begin work on his Christmas show. He needed months to work on the elaborate shows which included a myriad of themes, music and stage settings. The lighting was as dramatic as that of any theater in the country, and the curtains which would roll up and to the side were a marvel of stage wizardry. But it was all built around Mr. Bingle and Mr. Bingle was Oscar. Oscar was signed on as a full-time employee of Maison Blanche. "Oscar was incredible," Bell says. "He used to say, 'You have to eat, sleep and drink it,' meaning his work ... and he did. Everything about Mr. Bingle was and is stored on the second floor of the Westside store. Oscar had everything up there: wires, tools, boxes of arms, heads, hands, workbenches, rolls of colored felt, metal signs. That floor is called 'Bingle Land.' " Here was a man who did exactly what he wanted to do with his life. He brought happiness to kids through a simple little doll which he brought to life. And in doing that he brought unbelievable happiness to countless thousands of kids. "It does a lot for the store too," Bell says. "Mr. Bingle represents all the good things about the Maison Blanche stores and Christmas in New Orleans." Edwin Harmon "Oscar" Isentrout died in 1985. Mr. Bingle shed a tear but he stayed on. Oscar would have wanted it that way. But since Oscar's death, Mr. Bingle has not spoken a single word. He spreads his joy now not with that high-pitched voice that was so familiar for so many years; instead, he now does it only with his actions. "Oh, after a few drinks, I can speak just like Mr. Bingle," Bell says jokingly. "But no ... it just isn't right. As I said, Oscar was Mr. Bingle and Mr. Bingle was Oscar. Everybody just thought it would be better if we let that unique voice die with Oscar." The original Mr. Bingle, the one introduced to Oscar Isentrout in the MB offices back in the 1940s, is alive and well and has just begun headlining a Mr. Bingle museum of sorts in the Canal Street store. He spent the last year in a glass case in the Baton Rouge MB. His look-alikes will be performing in all of those Christmas extravaganzas in stores throughout Louisiana and Florida, and that's okay. "They haven't divided him or the Christmas cheer he spreads," Oscar would say. "They've multiplied him. Now there's a lot more of Mr. Bingle to go around." To Join Mr Bingle Collectables Club for free go to "messages"